I’ve been thinking about these three separate but related events – the magazine article, the public reading, the art that is no longer – and wondering how it is that the near West Side (geographically, a small slice of Cleveland compared to its counterpart on the East) attracts the attention of those capable of upward mobility? Wondering how calling out a CDC for their lack of action or shaming an artist for representing reality, has no true repercussion? The hardworking people of Fairfax and Hough are buried in their shortcomings, a little name-calling can’t hurt them, just as an organization as large as the Clinic can easily sweep a misgiving under the rug. And it doesn’t hurt. Not even Lovelace, who didn’t retaliate and said he was grateful for the (short-lived) opportunity. The East v. West divide doesn’t make sense to me in the 2000’s, but I obviously see it. When I first moved here in 2011 I was highly encouraged to move to an East Side suburb (aka not the East Side I am discussing here) or the near West Side because it was the brand of “up-and-coming” where people truly believe gentrification is mere weeks away. 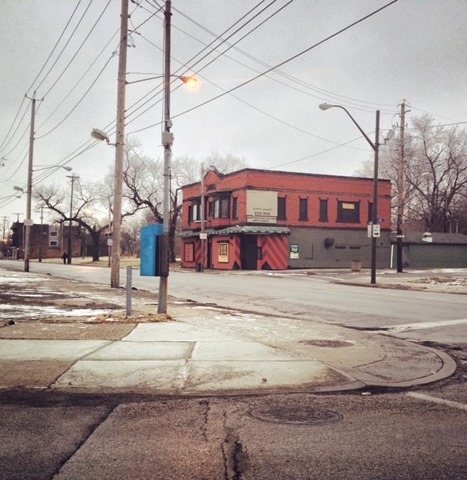 It’s scary to live in a real “up-and-coming” neighborhood – like the one I live in on the (real) East Side in Cleveland. A good man was shot two weekends ago waiting for the bus – TO GO TO WORK. But then again, the views of Lake Erie from the bluffs at the end of my street are breath-taking… albeit not in the same way. On the West Side, you have places like the Happy Dog and ABC Tavern, where customers drive Mercedes, order $9 craft beers but sit in ripped vinyl booths. Chain link fences separate the neighborhood from patrons at more than one establishment. On the East Side, you’ll see these same fences, but they’re construction fences as the University Circle neighborhood (the anchor of the East Side) booms with new businesses. In fact, two of these new businesses are actually duplicates of the two Nuevo- grunge bars mentioned above. Sure, a few minute walk from work versus a 20 minute drive is preferable for me, but as more and more of the same gets replicated (Trader Joes, Nordstrom Rack) soon there will be no reason to cross the great (really quite narrow) River. But that’s not really the issue here, because for the hundreds of thousands of people who take public transportation, replicating what they got in an hour now in twenty minutes or less, is brilliant. As Western establishments make the move East, and vice versa, I have no doubt that it will become increasingly apparent that the division line is not the River, it’s the streets, many streets. Too many streets. On the East Side alone (because my familiarity is greater) it is nearly impossible to avoid “the ghetto” en route from any place “not the ghetto” to another “not the ghetto” place. Sure, you can drive around on far-flung freeways all day, but in order for me to drive 13.5 minutes from home to University Circle (my work) I truly drive through the worst of the worst. I pass kids walking to school, shivering in a coat meant for spring in Florida, not winter in Ohio. I see acres of plywood and “don’t cut gras (sic)” signs. I see potholes that must stretch down to the earth’s core and across to China. I see despair, and I see life marching on as cars whip through the vast corridors of St. Clair and Superior, where six lanes of traffic could plow through if they wanted for there are no open businesses to necessitate parked cars. But from East to West, from Cleveland to Lakewood, or Rocky River, or Fairlawn, or North Olmsted? Smooth sailing. That chain link fence outside of Tina’s? There’s a divide. The meandering path of MLK Jr Boulevard? That’s a divide. And then there are less obvious ones, where there are fresh flowers in vases in the houses that ring CWRU. Oh, and then, quickly, houses without copper-pipes. Or people. And certainly no flowers. I am currently working on projects exceedingly close to these nodes and know of good, decent, devout people who live even closer. Again, some of the greatest institutions in the country (Cleveland Clinic, Cleveland Museum of Art) are less than a five minute walk from the intersection above. 5 mins. Walking. The length of two songs on your ipod, that’s what separates an intersection marked only by a sometimes-open-sometimes closed convenience store, a mess of a public housing complex and, in contrast, arts endowments in sums my head cannot comprehend. In the Plain Dealer (Cleveland’s newspaper) a few weeks back, the ‘North Coast’ section ran an article titled “If you don’t like the weather, wait five minutes”. As I drove to and fro this week, at speeds no more than 10 miles an hour – to battle the snow, the ice, the potholes, people darting across the road challenging me to a contest resembling a video game – I looked around and realized that if you don’t like where you are, drive / walk / run five minutes in ANY direction. DISCLAIMER: While I can claim to have traveled through the few intersections mentioned in the Scene author’s piece (and many others that are equally appalling, such as E.105th and Asbury, 9am on a Monday, above), it’s not as though I write this to assume some status as a white, young, female who has come through said portals in Cleveland where ye all must abandon hope at the threshold. I live where I live. I see what I see. I write what I believe. I’d love to hear your perspectives, too. This is a really interesting read. Thanks for the follow on Twitter, I might not have found you otherwise! As a huge fan of Cleveland as whole, it’s interesting to hear the perspective of someone who lives on the “east” side. I don’t know how I feel about the word gentrification, even NPR has reported that the word is no longer ‘dirty’ or carries a negative stigma as most gentrification no longer causes people to move out of their neighborhoods. But I don’t think you mean it in that manner here anyway. I don’t look at the east vs west so much as a divide, other than I feel like the ‘far’ east side is states away and I need an overnight bag just to visit being a west-sider myself, I look at it like a gap. A gap that is closing. The gap between ABC and Happy Dog is closing. The residence between Ohio City and Gordon Square is in transition, housing is stabilizing, the neighborhood is getting really good. And I think Cleveland is closing the gap between east and west too, with west side businesses moving east. But even on the west side, you have to cross from one “not ghetto” to get to the next “not ghetto.” The gaps are just closing a bit quicker over here. Living in Lakewood, a neighborhood that is highly dense in population for it’s, what, 4 mile radius, though “up ‘n coming” in business and food, has it’s fair share of problems. And as I drive south through Lakewood and toward West Park I’ve rammed some pretty gross potholes. I am so happy to hear the pride and feelings you have for the area you live in, I look forward to reading more honestly. I think, and hope, you’ll see the gap close soon. Sorry for the long comment! Thanks, Julie for the fabulous, long comment and, of course, for reading! I’m thrilled to hear from someone who sees the “gaps” as not static and closeable. I look forward to spending more time on this topic. I wonder if we have friends in common, especially in Lakewood. I hopped over to your blog and noticed you have a fitness / running page in the works. I am beginning to train for my first 1/2 marathon in May (the Rite Aid race), perhaps we share a similarity there, too!